Amber can be cut, scraped, sawn, drilled, sanded, filed and carved. It is always best to practice on some rough chunks before starting to work on a valuable piece. Like all manual arts, working with amber requires getting the "feel" of the material in order to get good results. Sawing is best done with a diamond-tipped circular saw mounted on a small bench motor. The work piece should be fed gently but firmly into the saw. A fine-toothed jewelers saw can also be used if you wish to do the work by hand, but then it is difficult to achieve a straight cut. Shaping to the desired size and basic form is accomplished on a sanding wheel or belt. Coarse grades (80 to 160 grit) are suitable for removing material rapidly; finer grades are used for final touches or to work to closer tolerances. Sanding and filing can also be done by hand, but of course that is much slower. Intricate carvings may be made using a Dremel-type tool and various dental-type burrs and saws. After shaping to the desired size and form, the surface will still be rough from the sanding, carving or filing. The final polishing is done on a cotton buffing wheel mounted on the bench motor. It is important to use the proper polishing compound with which to load the buffing wheel, and to apply it frequently. We use a dental polishing compound from Germany, but also suitable are Tripoli or any fine, neutral-colored polishing compound. 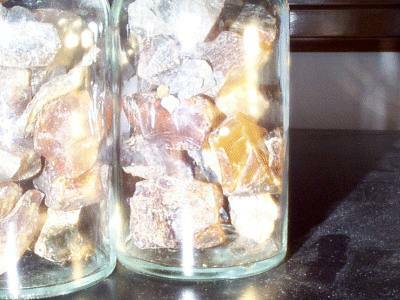 Avoid any strongly colored compound; it will discolor the surface of the amber. A word of caution: hang on tight to the work piece; the sanding or buffing wheel can grab the piece from your hand and dash it to the floor or against the wall. Very small pieces are difficult to handle, but it may be necessary in order to get a better view of an insect inside. We place a piece of double-faced Scotch tape on a finger tip and press the piece of amber on it. With extreme caution we can work pieces down to a thickness of two to three millimeters. time, after moistening it with vegetable or mineral oil, it will improve the appearance of the perforation. That is, it will not be so obvious. Amber may warm up to some degree during the sanding and buffing process, but no harm will result if it is good quality amber. Some softer grades of amber, presumably younger, may "run" on the sanding wheel, and some artisans prefer to apply water as a coolant. But we always work with "dry" and have no trouble. 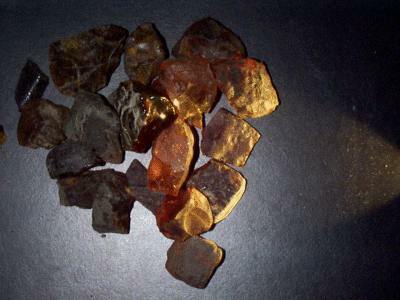 Amber is a fossilized organic substance, in this case fossilized resin. It is not a mineral. It is relatively soft (2-3 on the Mohs scale) and can be scratched easily. By the same token it polishes easily, as explained above. If dropped on a concrete or ceramic tile floor it may break, chip or shatter. A drop on a wooden or asphalt tile floor should not result in any damage. It is at least partially soluble in many chemicals - alcohols, chloroform, acetone and others. When not worn it should be stored in a soft-lined container or pouch. It should not be exposed for long periods to air or to direct sunlight. It is believed that exposure for long periods to air results in evaporation of some volatile components and results in crazing and cracking of the surface in three years or more. 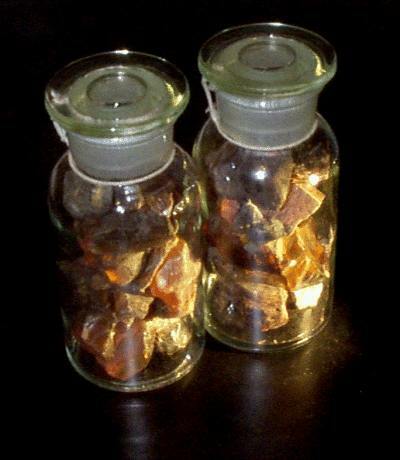 In the laboratory, exposure to strong ultra-violet light for a week reduced a piece of amber to a pile of powder. Application of a silicone-based wax (e.g., Turtle Wax) every 4-6 months restores the shine and helps to reduce evaporation and perhaps oxidation. 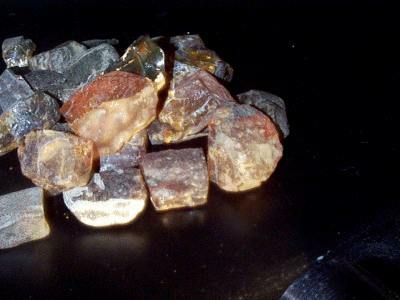 Here are some other pictures of raw amber.